I was having a rough go of it not too long ago. A rough go of life. Things I wanted to happen, didn’t. Things I wanted to say, couldn’t. Things I had worked at, failed. No need for details. We’ve all been there. It happens to all of us, doesn’t it? Rough patches. And some last longer than we thought we could endure. What I had to keep reminding myself, however, was to take in the good, take in the blessing, take in the positive that can always be found in the rough patches. It’s easy to get caught up in the rough/disappointing/unhappy/bad stuff that happens to us and that’s EVERYWHERE around us these days. So depressing! So much negativity. So much turmoil. So much grief. However, if we focus only on all the heartache, the weight of it all will surely crush us. Rather, instead of examining all the things that are going wrong, that are distressing, why not think about all the things are going right? Counting our blessings. Because we all have something to be thankful for. Loss can open the heart, regret can bring restoration, anxiety can alert us to threats, and anger can spotlight wrongs to be righted. Take in the good; take in the blessings. Neuropsychologist Dr. Rick Hanson says that “Given the negativity bias of the brain, it takes an active effort to internalize positive experiences and heal negative ones. When you tilt toward what’s positive, you’re actually righting a neurological imbalance.” And, happily, guess what? This builds stronger immune and cardiovascular systems, as well as increasing optimism, resilience, and resourcefulness. 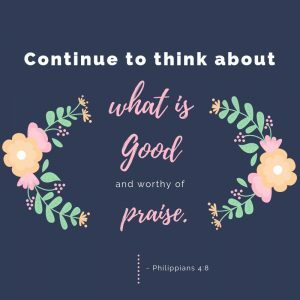 Focusing on what’s good, what’s wholesome, and then taking in that good naturally, increases the positive emotions flowing through our minds each day. Dr. Barbara L. Fredrickson, a leading scholar in the study of emotion and positive psychology, has shown that positive emotions don’t just feel good in the moment, but have long-term benefits. They lift our moods; they increase optimism, resilience, and resourcefulness; and they help counteract the effects of painful experiences, including trauma. It’s a positive cycle: Good feelings today increase the likelihood of good feelings tomorrow. 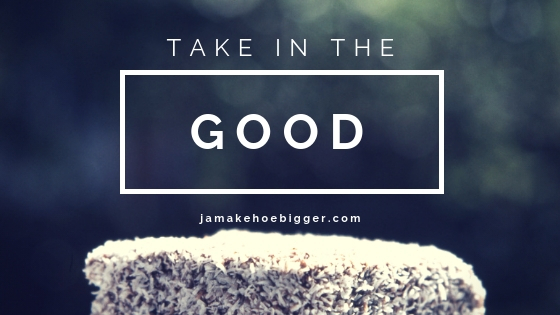 Taking in the good is not about putting a happy shiny, Pollyanna face on everything. It’s about turning away from the hard things in life. It’s about nourishing our hearts, our inner well-being, nurturing our contentment and peace—shelters during hard times where we can always return. Take in the good; take in the positive. 1) We don’t always choose our circumstances. But we always choose how we are in those circumstances. It isn’t as much about our circumstances as what we do with them. 2) We see what we expect to see. Look for good, and you will find good. Begin to see the good, to develop a posture of looking and of finding the positive, and you will find joy, you will find blessings. And we may come to realize that the most loved are often the small moments. If we keep our eyes open, we’ll discover that the good is all around us.